Assessment in an undergraduate medical course in India comprises of university assessment and internal assessment (IA). IA is a continuous form of assessment based on day-to-day activities and performance during the course. A specified IA is a criterion to appear in university examinations. The concepts in IA need clarification so that there is uniformity as per the Medical Council of India guidelines for IA. The logistic of scheduling various tests in undergraduate courses and the calculation of IA based on marks and subjective assessment needs to be done properly as it is being subjected to scrutiny by students as well as by law. Clarification of concepts, its revisions, and an Excel module can be useful in designing IA in a department, maintaining proper records, and making it easier to calculate it. Our designed module takes care of calculations automatically after marks are entered. The appropriate use of IA for providing feedback and remedial measure can be a great link in using assessment for learning. Assessment is an important and essential component of any curriculum. Unfortunately, it is also the most neglected component of the curriculum. There is a lot of emphasis and weightage given to summative assessment, i.e., university examinations. However, the summative assessment happens at the end of course only. The main focus of summative assessment is knowledge, to some extent psychomotor skills and very rarely affective domain. On the other hand, internal assessment (IA) provides multiple opportunities for the assessment of all domains, for example, procedural skills, such as intubation, minor surgeries, emergency care, and others competencies such as communication, ethics, and professionalism., IA provides a useful input in helping the students learn the concepts. It allows a longitudinal observation of the student. IA is not a mini-university examination but looks at entirely different set of skills and competencies. A good system of IA should look at not only knowledge but also the way in which knowledge is acquired, i.e., process aspect. It is capable of testing competencies which are not testable by traditional examination, and therefore, it is complementary to traditional examinations. It is dependent on assessment by multiple examiners in multiple settings so that it becomes more valid and reliable. This makes it clear that IA is not another “examination without external examiners” but is a different approach altogether and has to be dealt accordingly. The updates in concepts and calculations are need of the hour as there are many concerns raised about components of IA and its logistics. The updates in concepts will help to optimize the planning and implementation of the remedial measure. The updates in logistics will help to avoid unnecessary legal hurdles. Which Assessment Constitutes as Internal Assessment? IA can include all activities happening during the period of learning in a particular subject. The marks in tests may constitute a major part of IA (80%). It includes the marks obtained in various tests, i.e., theory and clinical/practical tests. The IA takes into account the day-to-day activities of the students including the way they learn, daily observation of students, their day-to-day work, attitude, professionalism, and presentations in seminars. This may also include other academic activities such as research projects, essay competitions, participation in subject-specific quizzes, and carrying out community-based projects [Table 1] but not limited to these only. It is a continuous process. It may be noted that though this has 20% weightage as marks (or 2 marks out of 10 for a subject with total marks 100), it nonetheless conveys to the student the importance of participating in such activities., One of the criticisms leveled against IA is its subjective nature; however, there is plenty of evidence in literature to suggest that expert subjective assessments are not synonymous with bias and that they can be as reliable as highly objective ones. [Table 1] provides the detailed components of IA as per medical council of India (MCI). The above activities must be in that particular subject only for which IA is being calculated for example, a project/publication in pharmacology should be considered for IA of pharmacology only, and not others subject such as microbiology and surgery. The IA should not be based on comparing students with each other, or on the other words, it should not be norm-referenced assessment or expressed as percentiles but should be criterion referenced. MCI regulations allot 20% marks in each subject in theory and practical to IA. A student must score at least 35% marks in IA separately in theory and practical to be eligible to appear in university examination. Let us take the example of a subject with total of 100 marks, where 10 marks each will be allotted to theory and practical each for IA. Distribution of marks in the subject with 100 marks is depicted in [Figure 1]. For subjects with more marks, the IA will be proportionately increased. Fifty percent of the aggregate (item 2+ IA in theory). Known as total theory marks. 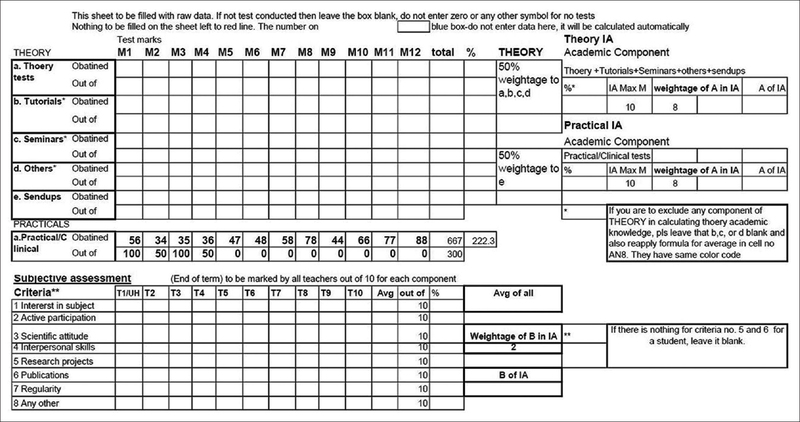 Fifty percent of total theory marks + total practical marks (total of item 3 and 5). A student needs to pass sequence 1 to reach sequence 2 and so on; otherwise, he fails in the examination. This is also in alignment with Honourable Supreme Court of India's decision on IA. However, there is lack of uniformity on this and at many places, and IA marks are added to university marks to decide pass/fail decision. An example of a subject with components of IA is shown in [Figure 1]. Therefore, it is important to consider two scenarios that will clarify the role of IA. A student scores 40% marks in IA (step 1). Therefore, he/she is eligible to appear in university examination. In university examination, the student gets 50% marks in theory + plus (step 2) and 50% in practical (step 3). However, now, the aggregate of step 1 and step 2 is below 50%, hence, the student fails. A student scores 80% marks in IA (step 1). Therefore, he/she is eligible to appear in university examination. In university examination, the students get 45% marks in theory + viva (step 2) and 50% in practicals (step 3). As the student is not able to clear step 2, i.e., <50% marks in theory + viva, he/she fails inspite of high IA. Hence, it means that inflated IA will not compensate for university examination passing. Therefore, IA is a criterion to appear in university examination and not an assessment that can be manipulated to compensate theory + viva marks. This will also decrease the unnecessary inflation of IA marks as well as pressure on teachers. The IA should be periodically (and on demand) shared with students. The feedback should be provided to students throughout the course so that they are aware of their performance and remedial action can be initiated well in time. The feedback need to be structured and according the faculty and students must be sensitized to giving and receiving feedback. Unfortunately, the feedback component becomes only a formality for most of the schools. The results of IA should be displayed on the notice board within a week of the test and an opportunity provided to the students to discuss the results and get feedback on making their performance better. It is also recommended that students should sign with date when they are periodically shown IA records in token of having seen and discussed the marks., The signing at regular intervals safeguards the departments from legal hurdles later on when students/parents raise objections and make unawareness as their main reason for not taking remedial actions. The major use of IA should be to provide remedial support and opportunities so that students can improve their learning. The remedial measures can be predecided or individualized based on students' requirements. These actions should be implemented as soon as a lag in performance is noticed. However, one should be careful here not to segregate or label students as bad or good students. For appropriate acceptance and success of remedial measures, involving primary stakeholders, i.e., students, maintain their confidence, and faith in the system. At times, secondary stakeholders such as parents, foster parents, or administration may also be involved. A student whose final IA in a particular subject is less than required to appear in university examination can be given one chance to improve. This test(s) should be conducted after a gap of at least 2 weeks from previous tests. The caution is needed here to avoid misuse of the opportunity given. The scores in IA can influence the final university scores obtained by a student as the marks are going to be added to the university examinations. The misuse of IA by inflating the IA marks is quite prevalent. To prevent inflated or too low marks in IA, the scores on IA should be separately displayed on the detailed marks card. This also gives a better insight not only into the learning of students but also on the course of learning of a student for future employment e.g. student A with IA 85% and university exam marks 55% versus student B with IA 55% and university marks 90%; What interpretation you can make out of this if you are an interviewer for these students?. This is an area that has been challenging especially in clinical subjects due to the assumed time constraints. 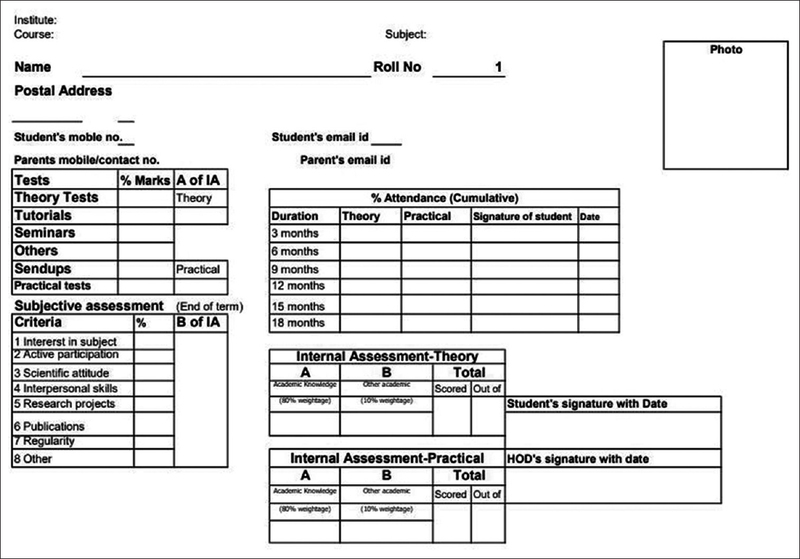 A proposed schedule of IA is given in [Table 2]. There should be minimum of two tests of theory/practical per semester in basic/paraclinical subjects. This should be supplemented by send-up or term end (6 monthly) examinations. Thus, a subject being taught over two semesters should have a minimum of four tests while subjects over three semesters should have a minimum of six tests. For clinical subjects, there should be at least one test per semester for theory and one clinical/practical at the time of completion of clinical posting. Pre-university send ups should also be held in the clinical subjects. Before university examinations, departments can conduct additional tests as and when required with the purpose of providing formative feedback to the students. The departments should coordinate among themselves to ensure that no two tests are scheduled within the same week. In addition, to prevent students from missing classes and clinics before the tests, the tests should be scheduled, as far as possible, on a Monday morning. The IA of broader specialties should also include marks in allied subjects, i.e., medicine to include skin, psychiatry, and pulmonology while surgery should include orthopedics, radiology, and dentistry also so that students do not ignore these postings. Out of total marks for IA in broad specialties, 10% should be from each allied subjects, i.e., out of 30 marks in IA for medicine; nine marks should be from allied subjects (3 marks each from dermatology, psychiatry, and pulmonary medicine). Similarly, for Surgery IA, radiology and anesthesia will contribute 10% each to the IA (three from radiology and three from anesthesia) while orthopedics will contribute 20% (i.e., six marks from orthopedics). It may be noted that although very small contribution is being made by minor subjects; yet, it serves as motivator to the students to not miss these postings. A student who has not taken minimum required number of tests for IA each in theory and practical will not be eligible for university examinations. Weightage given to send up can be 50% and class tests 50% for IA. We have developed an Excel-based module for IA, where marks can be entered, and the rest of the calculations are automatically done for the IA. The detailed generic module, i.e., IA module (IAM) can be used for various courses. The generic version can be obtained from us on request. This version of IAM can be customized to a number of students and number of tests. The module takes into account the various components of IA including marks in various tests, interest in subject, and projects. The marks are to be entered in the relevant columns after each test, and IA marks are updated accordingly in IAM. The module gives flexibility to modify the criteria for subjective assessment. The marks part has options for marks in various tests such as theory tests, practicals tests, and seminars. The subjective assessment part is to be marked by all teachers and average score is taken into account. We have also given a schedule of tests to be conducted in each subject [Table 2] that gels well this Excel module. A source data (SD) (detailed data of tests etc.) will be filled in the SD sheet by the department, and automatically IA will be calculated as per prefilled formulas in IAM [Figure 2]. The mainsheet will display final IA for theory and practical [Figure 3]. The entire SD used to fill the various marks on IA form should be maintained properly. There are instructions and color coding in the module to help the faculty. The proper use of IA as per guidelines can be helpful in identifying the learning needs of the students at an early stage of their learning and avoid unnecessary issues at the time of university examinations. These updates in concepts and logistics can optimize the use of IA for improving the learning of students as well as make students and keep all the stakeholders well informed, and therefore, avoid legal hassles in education. Badyal DK, Singh S, Singh T. Construct validity and predictive utility of internal assessment in undergraduate medical education. Natl Med J India 2017;30:151-4. Singh T, Anshu. Principles of Assessment in Medical Education. 1st ed. New Delhi: Jaypee Publishers; 2012. Singh T, Anshu. Internal assessment revisited. Natl Med J India 2009;22:82-4. Medical Council of India. 12. Examination regulations, (2) Internal Assessment, Regulations on Graduate Medical Education. (Amended up to July 2017). Ch. 4. Medical Council of India; 1997. p. 60-1. Available from: https://www.mciindia.org/CMS/rules-regulations/graduate-medical -education-regulations-1997. [Last accessed on 2018 May 14]. Singh T. Student assessment: Issues and dilemmas regarding objectivity. Natl Med J India 2012;25:287-90. Supreme Court of India. Case NO. : Appeal (Civil) 3883 of 2006. Available from: https://www.sci.gov.in/jonew/judis/29131.pdf. [Last accessed on 2018 May 14]. Burch VC, Seggie JL, Gary NE. Formative assessment promotes learning in undergraduate clinical clerkships. S Afr Med J 2006;96:430-3. Rushton A. Formative assessment: A key to deep learning? Med Teach 2005;27:509-13. Gitanjali B. Academic dishonesty in Indian medical colleges. J Postgrad Med 2004;50:281-4. Singh T, Gupta P, Singh D. Continuous internal assessment. In: Principles of Medical Education. 3rd ed. New Delhi: Jaypee Brothers; 2009. Medical Council of India. (2). General Considerations and Teaching Approach, Regulations on Graduate Medical Education. (Amended up to July 2017). Ch. 1. Medical Council of India; 1997. p. 5. Available from: https://www.mciindia.org/CMS/rules-regulations/graduate-medical-education-regulations-1997. [Last accessed on 2018 May 14].